Soundwave is a character that really needs no introduction. If you grew up in the 80s like I did, then he is one of a handful of characters that embody the idea of Transformers for your generation. He and his tapes were visually captivating in the cartoon, compelling characters in the comics and entertaining and addictive as toys. But because his alternate mode is so very, very stuck in the 80s, Soundwave has suffered the indignity of being repeatedly and drastically reimagined in each subsequent iteration of the franchise that used him. And while a car Soundwave or an MP3 player Soundwave or a weird spiky alien truck thing Soundwave are interesting diversions, none of those toys managed to capture the look and feel of the original Soundwave very well. Because of that, when the Masterpiece line began to pick up steam and put out more than just constant redecos of Optimus and Starscream it was clearly only a matter of time until they produced a Soundwave. I was leery of the prospect, honestly. The Masterpiece line, like every other Transformers line, has had its ups and downs. And while it's produced a gems like Grimlock and both versions of Optimus, Takara has also sullied it with ugly junk like Megatron and quality control/engineering disasters like Rodimus Prime. Soundwave is one of my favourites and an iconic character, and it would have made me really, really sad to see him suffer the same fate as Rodimus, another favourite. I was more than a little sceptical, but I'm very happy to say that I was worried for nothing. 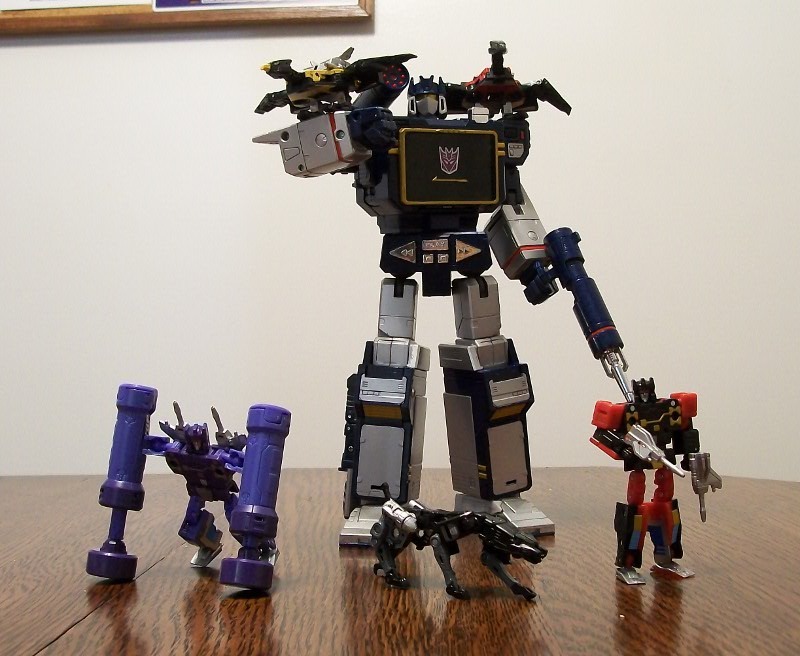 Soundwave is very much deserving of the label "Masterpiece". 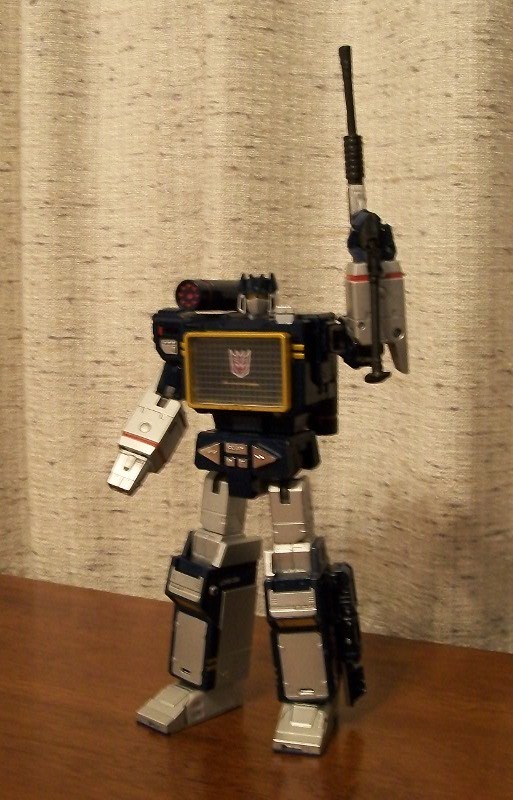 The original Takara release of the figure came with only one cassette, Laserbeak. 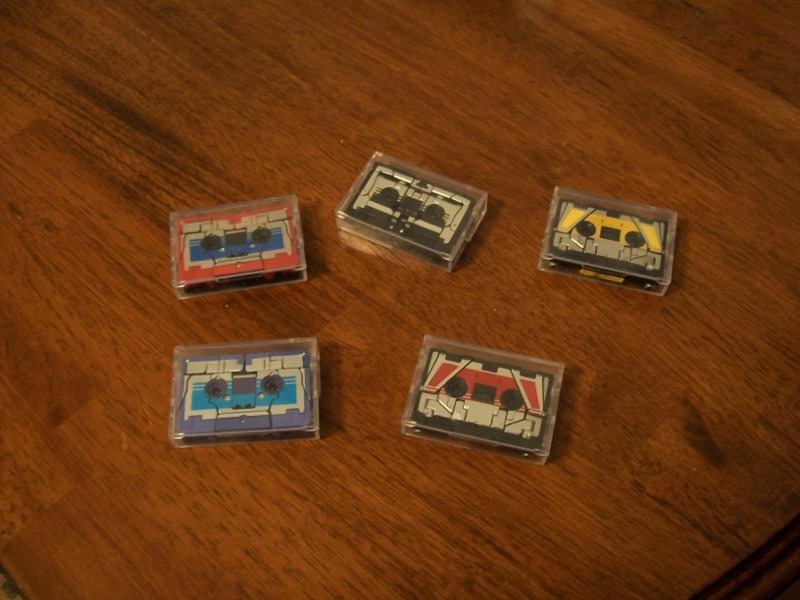 Additional cassettes -- Rumble, Frenzy, Ravage and Buzzsaw -- were sold in separate two-packs. The Hasbro release of Soundwave, on the other hand, comes will all five tapes and retails for less than half the cost of accumulating the Takara set. Changes between the two releases are minimal, with the exception of eye colour -- the Takara toy uses cartoon red and the Hasbro Soundwave uses toy-accurate yellow. The Hasbro version is the one I got, and I couldn't be happier with it. Robot Mode: Soundwave's robot mode is...Soundwave. I realize that's a tautology, but it's also the most accurate and concise way of describing just how perfect he looks. If not for the yellow eyes and exposed joints in the hips, you could look at a picture of him and think that it was a picture of his character model instead of a physical toy. He's a mixture of dark blue, grey, silver and chrome, with some small red and gold highlights. And unlike the standard offerings from Hasbro these days, there are no obviously missing paint applications or panels that should be more detailed but aren't. Soundwave is bloody gorgeous, at a level only matched by perhaps two or three other Transformers in my collection. Soundwave features a wonderful level of articulation, with all the joints you would expect and then some. His neck, shoulders, elbows, wrists, knees and ankles all have a full range of motion, with only his hips really leaving something to be desired. The hip joints are built from an odd combination of ball joint and ratchet joint, are quite stiff and seemingly won't allow you to move his legs backwards, only forwards. That hampers poseability, but practically speaking it's only a little problem since 90% of the time I want to pose Soundwave deploying or interacting with his tape minions rather than breakdancing or sprinting or something. He also features opening hands with individually poseable trigger fingers, a nice touch but also a troublesome one -- the tips of his trigger fingers are tiny and have a nasty habit of falling off if you're not careful. But on the positive side, he has double-jointed ankles and die-cast feet that make him very stable and prevent him from toppling over in a light breeze like so many larger Transformers. 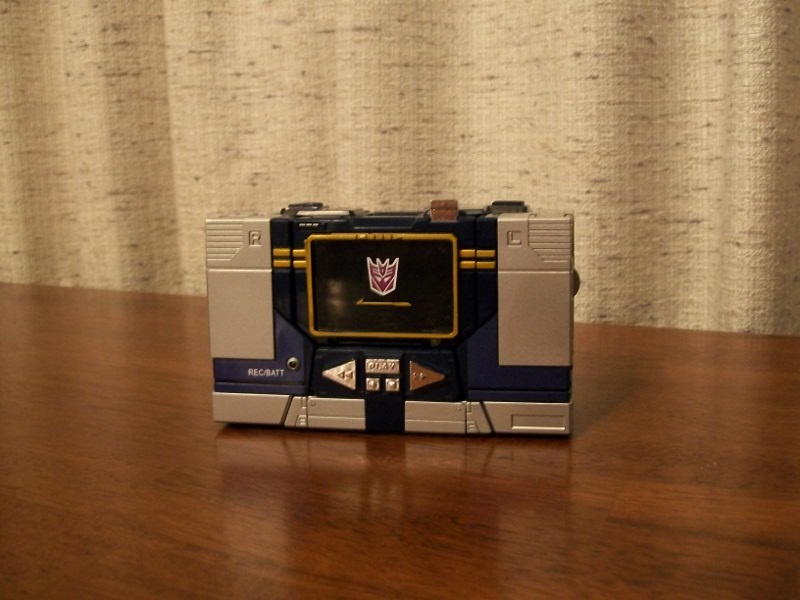 Soundwave also comes with a lot of accessories, even without taking the tapes into account. Of course, he comes with his traditional concussion blaster, which folds out from a small cylinder into a sizable hand weapon, and his shoulder-mounted missile pod (which is no longer technically an accessory since it's permanently attached to the toy). He also comes with a handgun-mode Megatron perfectly scaled to fit in his hand, a 'display screen' to simulate the time that he used his tape door as a TV screen in the cartoon, an 'Energon cube' (sadly not pink) that he can extrude from his chest and a 'sensor pod' thing that can mount in place of one of his hands. Honestly, anything beyond the traditional gun and shoulder cannon seem superfluous to me since he looks so great just holding those, but the extra accessories are a nice touch. With them, you can give Soundwave a different look every day of the week and still have more possibilities left over. Soundwave also features a few built-in play features. The main one that comes into play in robot mode is the tape door in his chest, which pops open and allows him to store up to three minions inside at any time. A button on the top of his chest opens the door and another button on his back will pop the tapes forward if more than one is stored. Unfortunately, the gimmick doesn't work quite as cleanly as the original Soundwave's did. Including three tapes means that the tapes themselves don't get 'grabbed' by the door as on a real tape player, so sometimes the door will pop open but the tape will stay in place and need to be gently pried out. That in mind, I'd almost have preferred that they restrict him to ejecting a single minion properly, though I do appreciate the effort and understand what they were trying to accomplish. That's a minor flaw, though. And so while Soundwave's robot mode isn't strictly flawless, it's pretty damn close. A Transformer that looks this good, poses this good and plays this good is a rare thing indeed. Alternate Mode: Of course, the reason why Soundwave's robot mode could be so satisfyingly simple is pretty obvious when you transform him and remember that he transforms into a rectangular box. But it's a very detailed box! His colour scheme carries over from robot mode, mostly blue and silver with some gold and chrome. He also features all the things you'd expect to see on a microcassette recorder: the tape door, an opening button, headphone jack, battery light, play, stop, record, rewind and fast-forward buttons (the latter two of which are spring-loaded like actual tape recorder buttons) an on-off switch and a volume dial. Even though the tape player mode is really just an excuse to have cassette minions, the designers clearly spared no expense in making this mode look the part. It's not perfect, though. Even though old microcassette recorders were big, I doubt they were ever this big, and especially in the 80s. 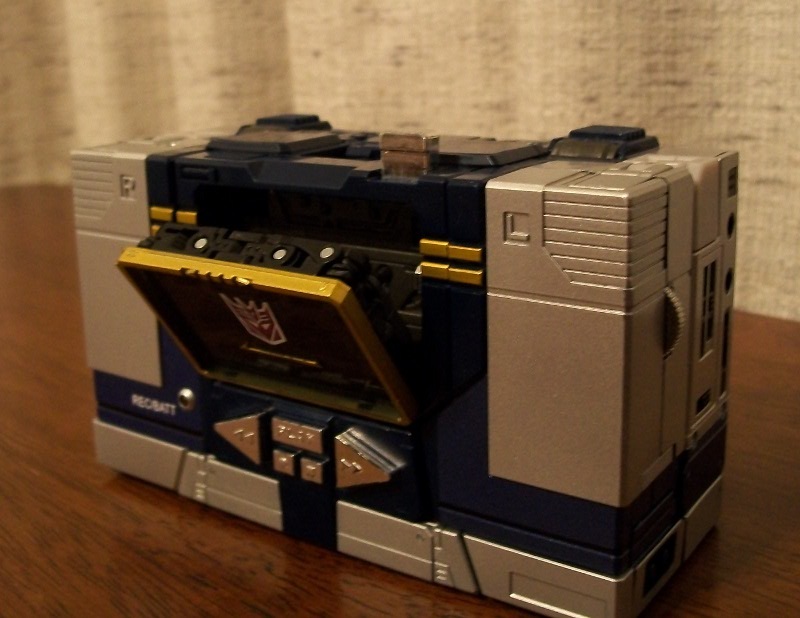 Soundwave is almost the size of an old Walkman and quite thick. But while he's probably not real-life accurate, his proportions in the cartoon were always pretty hefty and that's what this toy is trying to evoke, so I'd say it works for me. If you're keen on doing something with his accessories, you can take his scanner alongside Rumble and Frenzy's piledrivers and combine them into the data jack that he used to connect to a computer at the start of the 80s movie, though that seems a bit silly to me. Still, the option is there and it's neat that the Takara designers thought of it. The tape-ejection gimmick still works in this mode (really, it better...), as described above. Beyond that Soundwave's alternate mode doesn't really do anything, but it doesn't really need to. 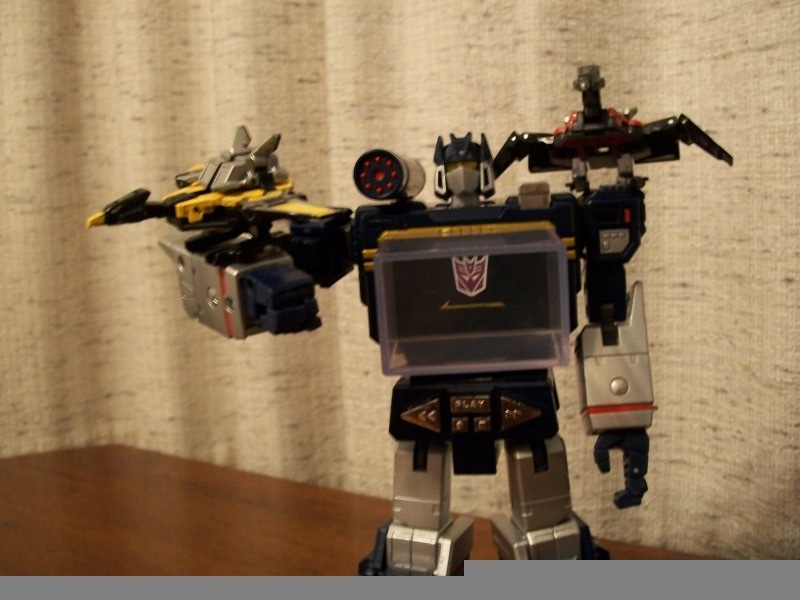 Buzzsaw and Laserbeak: A friend of mine who got the Takara Soundwave referred to the set as "Masterpiece Laserbeak with some tape player guy". And you know what? He's not too far wrong. As impressive as Soundwave is, the bird cassette mold is nearly as good. Laserbeak and Buzzsaw are the perfect spitting image of their cartoon models in beast mode, down to the tiny flip-up camera built into their head. They also have grooves cut into their feet, allowing them to securely mount onto Soundwave's forearms and shoulders to replicate their traditional "perch on a senior Decepticon" shtick from the 80s. The feet are large enough to allow them to perch stably on any flat surface even without using the mounting grooves, too, so if you're unlucky enough to own a Masterpiece Megatron one of them could keep him company as well. The paint work on both of them is gorgeous, too. They share the same deco, more or less, with Laserbeak mainly painted in red and Buzzsaw in light orange (not the flat, drab gold of the original toy and recent data disc). The paint jobs aren't perfect, though -- Laserbeak has a couple minor flaws and Buzzsaw is already showing signs of light paint wear inside his main wing joint. Probably the most impressive thing about them, though, is their transformations. The original toy came with twin cannons that mounted on their backs, but the Masterpiece design incorporates the cannons into the transformation scheme, negating the need for external accessories. When I first heard that I expected the transformations would be an overly complex mess, but no! They fold up very simply and easily, without any major headaches to speak of. Articulation is a bit of a downer, though. The wings can flap around a bit and the heads and necks can crane up and down, but lateral movement is nil. A ball joint at the base of the skull would have made these little guys perfect in my opinion, but they're so small that that might not have been structurally sound. Rumble and Frenzy: At this point, I think we need to assume that Hasbro is trolling the fandom. How else could you explain them producing two or three blue Rumbles based on the toy colour scheme (in which Frenzy was the blue one), only to take the Masterpiece molds, colour them with cartoon-accurate schemes and then call the blue one Frenzy? But who's who isn't important -- what matters is that they're bloody awesome. I praised Buzzsaw and Laserbeak for being spot-on adaptations of the character model, but Rumble and Frenzy take that one step further. Not only do they look like they just stepped out of a screenshot from the cartoon, they also have nearly as much articulation as a standard Deluxe figure! I don't think I've seen more than a handful of toys with this much poseability at such a small scale. On the other hand, these two don't integrate their accessories into their tape modes. But then, how could they? Each one comes with two massive pile drivers that are probably bigger than the figures themselves, as well as two very, very small blasters that can either plug into their backs or be handheld as pistols. The colour layouts and paint masks on both are again basically the same. One of them is bluish-purple and lavender like cartoon Rumble, with silver chest deco. The other is black and red, like cartoon Frenzy. Since the whole set is basically cartoon-based, I decided just ignore the names on the package and go with the cartoon names rather than put up with the cognitive dissonance as my brain constantly tries to correct itself. But no matter who is which, they're gorgeous, well-built little toys. Ravage: You know...in any other context, I'd look at this Ravage and say he was brilliant. He's way better than the original, and also way better than the Universe toy that came out four years earlier even though they're on about the same level of complexity. But compared to the three other molds in this box, Ravage winds up looking just a bit...pedestrian, almost. He's a good approximation of a Ravage who turns into a cassette, but not especially faithful to the character model. He's boxy with twiggy legs, not all that far off from his look in the early comics but miles away from the sleek cat he was in the cartoon. In a different time and place that wouldn't be an issue, and I'd just wave it off by saying "well clearly they can't get the cartoon model 100%". Except they did get it 100% with the other five characters in the set, leaving Ravage the odd one out. He does have some good features, though. Ravage is fairly well articulated, with jointed hips, knees and ankles on all four legs that put him ahead of any other Ravage I own. But like Laserbeak an Buzzsaw his head can only move up and down, not side to side. The end result is a little sloppy compared to the other three...he can pose, but he doesn't look as good in any mode. His hip missiles are included as part of his transformation, which is a nice thought. Unfortunately, they're molded directly into his hips and move like part of his body, making them look less like a weapon than a decoration. All in all he's easily the weakest of the tapes, not terrible but definitely not up to the standards of the rest of the set.